Steven Universe and his family the Crystal Gems are here to save the day... the Birthday! 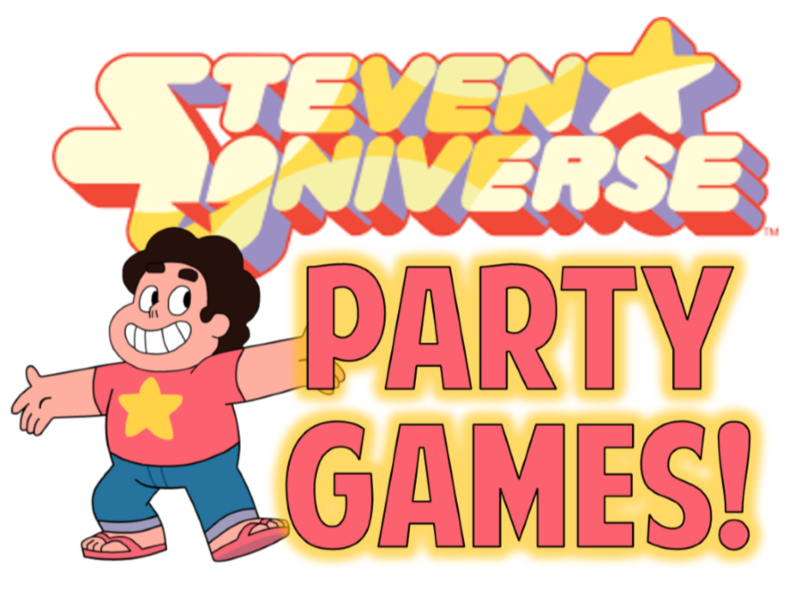 Get ready for an out-of-this-world good time with our top ten favorite Steven Universe party games. These games were selected to entertain kids between the ages of 6-12. When each guest arrives, have him or her reach into a large bag with an assortment of plastic gemstones. Each guest will reach in and select a gem at random. Then have them create a They now have their party name! If there are too many guests and not enough unique gems, double up or assign families by gemstone. 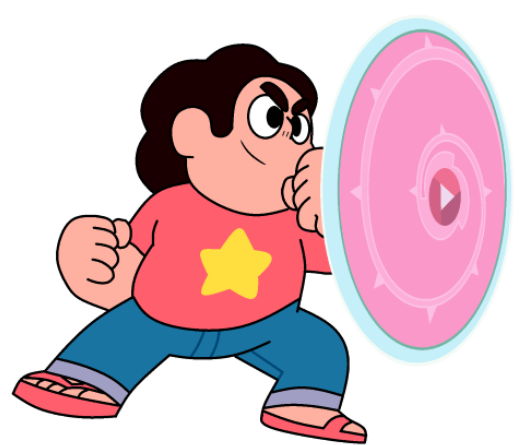 In Steven Universe, it doesn't matter what kind of gem you are assigned, it matter what kind of person you are. I found the gem stones to the right on Amazon. Great deal, you get 36 assorted stones for $8.99. You can also check your local dollar store. 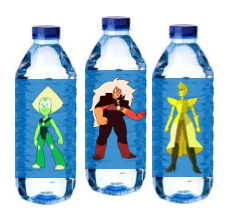 In Steven Universe, two or more gems can join together as one to become a Fusion. In this Fusion, they're able to do more and be stronger. This next game plays on that. Set up a simple obstacle course involving cones corners, and steps. 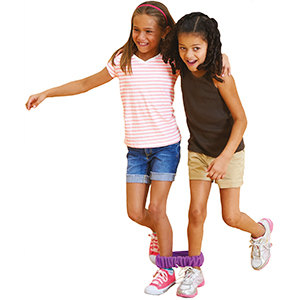 Use belts, rope, or strips to tie two people together at the sides. Tie one leg of each person together like a traditional three-legged race. Each guest can only use one hand. Each fusion has to weave through cones and overcome obstacles with three legs and two arms. Have each Fusion race to put objects into baskets at the end of the obstacle course. 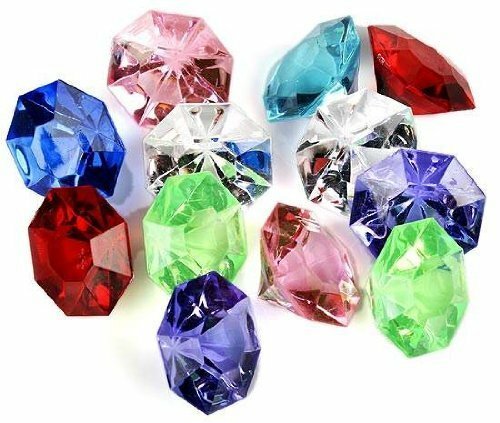 For added difficulty, announce that whoever picks the object up must pass it, behind his or her back, to their gem Fusion partner to place in the bag. If an object falls, they have to pick it up, put it back in the basket, and pick it up again to pass it. Whoever finishes first wins. 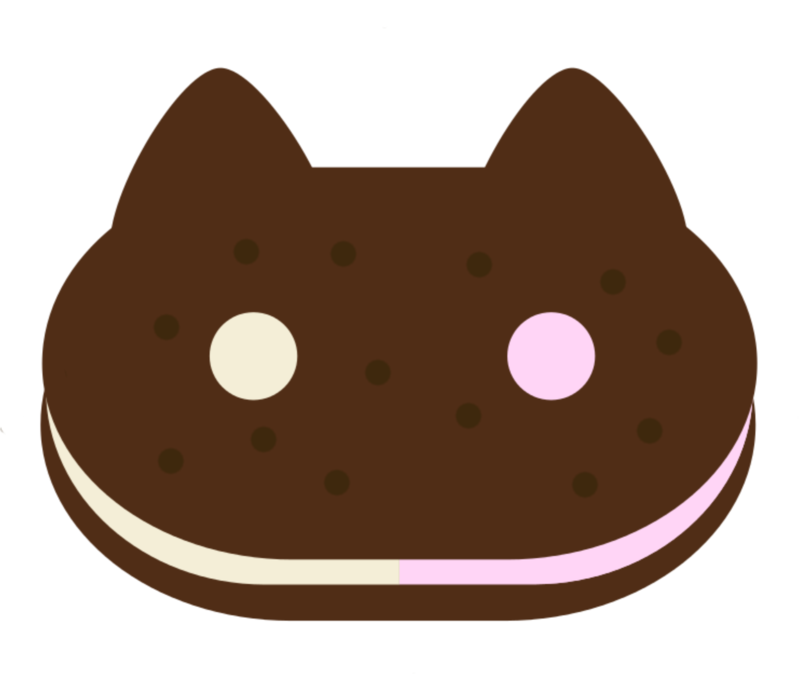 Print out our free sheets of cookie cats and hide them around your party area. Players search high and low to find as many cookie cats as they can. The player that finds the most cookie cats wins! Some gems think Fusion is a bad thing. For the next game have each guest sit or stand in a circle. Everyone must close their eyes and bow their head. At the count of three they must point and look at someone else. If two guests are looking at each other and pointed, they perform Fusion and are out of the game. The last two players in the game wins. Someone in a Steven Universe episode once shouted, "Oh, my gosh. Forget homework. Let's take it from the top!" Was it Amethyst or Connie? Separate teams into two sides, with fans on both sides for fairness. Hand each team a buzzer or other noisemaker. One announcer can read a Steven Universe quote out loud and each team needs to buzz in to answer. Correct identification of the quotes grants the team a point. The first team to ten or twenty wins. Have a bonus round halfway through the game for non-fans and people who haven't seen the show. Hand them a list of all the potential characters with a picture next to each name. Read a quote and have them guess based on the name and picture. Correct answers in the bonus round are worth two points. 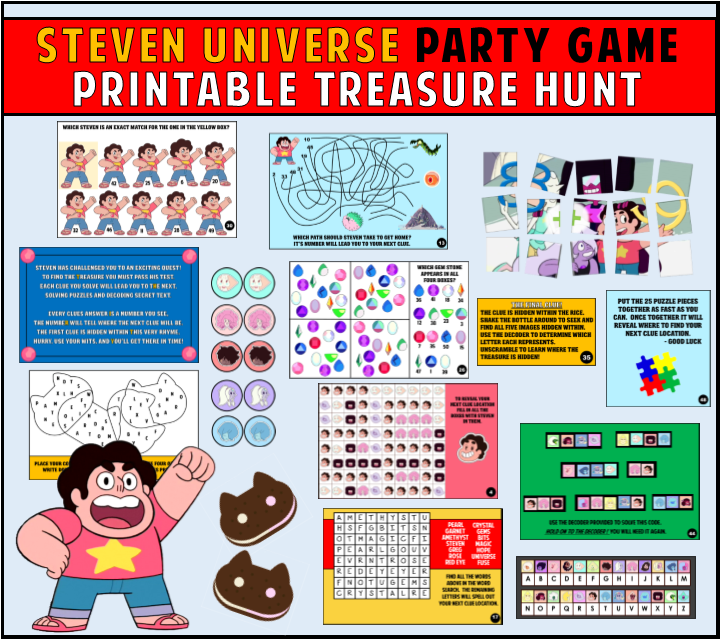 Our exclusive Steven Universe Treasure Hunt was created especially for the Steven Universe themed Birthday party. This hunt features 10 fun, different, and interesting clues, each clues answer will lead to the next location. The best part is that you can play this game anywhere because YOU decide the hiding location. 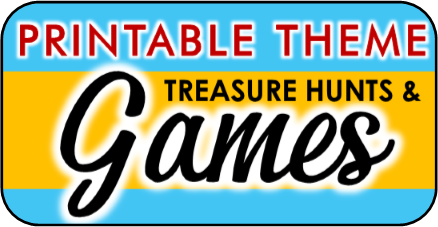 The next best part is this treasure hunt game was created so that even players that aren't familiar with the show can play it. For complete details, clue examples, and instant download link click on picture on the left. 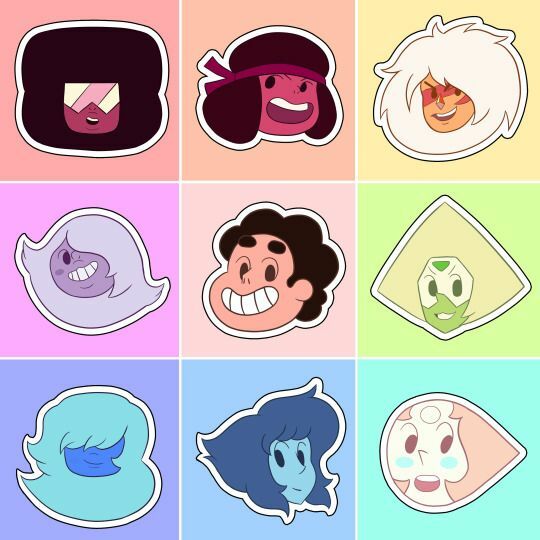 Find Steven Universe villains online and print them out. Tape them on empty water bottles to set up the targets. I would suggest six or seven. Line up the targets on a table about five feet from players line. Have an assortment of rubber bands ready and give each players one minute to sling rubber bands at the targets and knock down as many villains as they can. Create mini rose quartz shields using red paper plates. You can get creative and decorate them like the shields with pink swirls and so forth or you can leave them as is. Players each get a shield. Create a line using tape across the center of your playing area. Divide players into two teams and have each team stand on one side of the line. Toss a balloon up in the air, players can only touch a balloon with their shield and once it touches the ground it scores a point for the other side. Toss a new balloon onto the playing field every few seconds until you have tossed out all 10. When all the balloons have fallen whichever side had the LEAST amount hit the ground on their side wins. 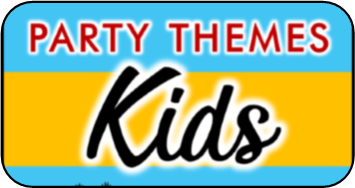 This game is, as you have probably already guessed, a spin-off of the classic party activity Pin the Tail On the Donkey. You will need a poster size picture of Lion. If you have any drawing skills or know someone that has drawing skills this would be great place to use that talent. 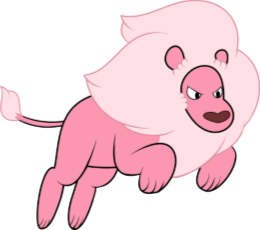 Draw Lion on a poster board without the tail. Create a tail for each player using pink poster board. Hang the poster about eye level to the players. Attach tape at the top of each players tail. Blindfold one player at a time, spin them around three times, and face them toward the poster. The players whose tail lands closest to the place where the actual tail should be wins. For this game you will need to cut large circles from poster board and draw on them something the players can 'shape shift' into (pose as). Usually characters or animals are chosen but feel free to get creative. Players dance around the playing area and when the music stops they have five seconds to get to a shape shifter circle and freeze. Any player not on a circle or who does not stay frozen is out. After every stop remove enough circles so that there is one less than there are players for the next round.